If you've never listened for bats, now's your chance at the 12th Annual Indiana Bat Festival on Sept. 15. The Center for Bat Research, Outreach, and Conservation hosts the annual event, which has both daytime and evening sessions. 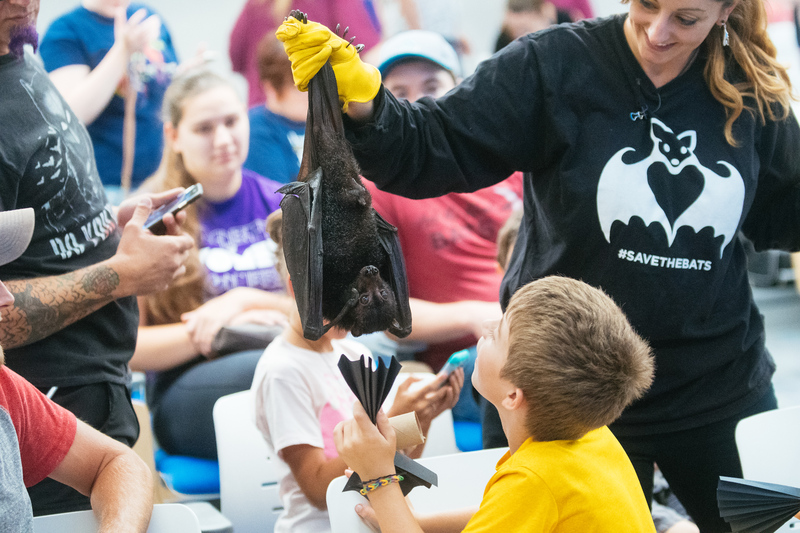 Themed "A Year in the Lives of Bats," the Bat Festival's daytime events will feature experts from Indiana State University and around the country who will give talks on what bats do during each of the four seasons. At dusk, there will be a listening for bats activity, where Indiana State graduate students and Joy O'Keefe, associate professor of biology and director of the bat center, will help people use detectors to listen for bats at night. "We want to try and dispel some of the myths about bats and try to promote how good they are for us and our environment. Maybe change people's minds that they're not really that bad," said Brianne Walters, assistant director of the Bat Center. It's a benefit to have bats around because they eat tons of bugs - one bat may eat half its body weight in insects on an average night. But they are facing serious impact from disease and human development, so O'Keefe hopes events like the Bat Festival bring awareness and help find better solutions that allow humans and bats to co-exist. "This is a huge celebration of bats and it's nice to see all of the enthusiasm people have on that day because the perspective on bats seems to be changing," she said. "When we go to the store and buy Halloween stuff now, there are a lot more friendly-faced bats and that's something I couldn't have imagined even 10 years ago. I think this festival and other efforts like it around the country has really helped turn the tables on how we see bats and have gotten people to recognize the value of bats." Daytime activities, which will run 10 a.m. to 4 p.m. in the Science Building at Indiana State, will include crafts, an inflatable cave for exploration and other children's activities. There will also be live bat presentations, and a group will bring raptors. A silent auction and bake sale will also be available. All proceeds go toward the Bat Center's outreach funds. The festival's evening events pick up again from 6 to 9 p.m. at Dobbs Park, where there will be a live raptor talk and a bat talk. Children's activities will be available, including an obstacle course to teach about bats and how to conduct bat research. Both daytime and night time events will be available.